Ok, so it’s properly cold now. Gratin weather has begun and what better way to start than with celeriac. I’ve gone all out today, roast chicken in the oven, next week’s cake recipe just gone in and a diet busting gratin with Gruyère and lardons is just out, crispy and golden. Yum!!! Auggie and Dan reckon it’s time for lunch. But you just had breakfast guys and it’s celeriac, something you (Auggie) said you’d absolutely NEVER eat (gotcha!!! ).Yes, this is perfect food for a cold Autumn day…….. Squeeze the lemon into a bowl of water and have on standby before you begin. Trim the celeriac of the gnarly outside part. Next, cut in half then slice as finely as possible dropping the slices into the lemon water as you go (this stops them discolouring). Heat the stock then transfer the celeriac slices into it and bring to the boil then simmer until just tender. Fry the lardons in a drizzle of olive oil until golden. 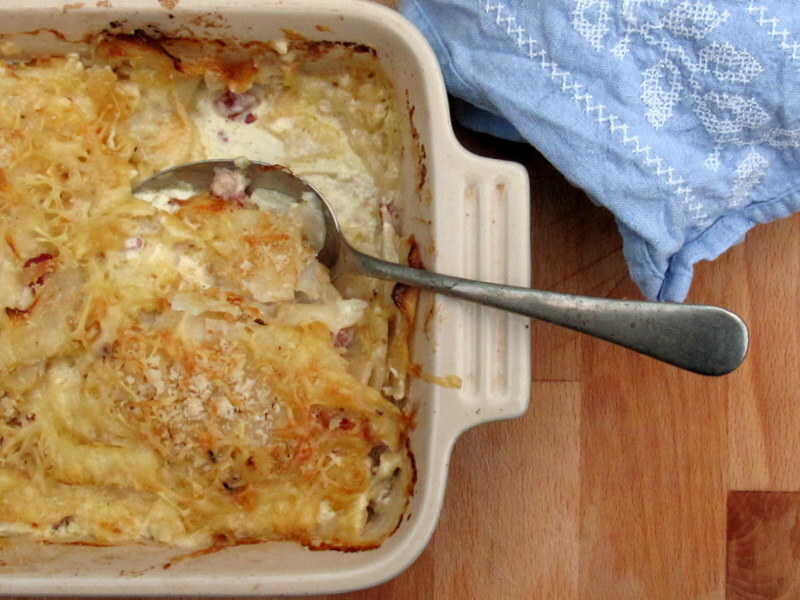 Transfer the celeriac and remaining stock to a baking dish and toss with the bacon and half the cheese. Add the cream and a generous pinch of salt and grinding of black pepper. Top with the remaining cheese and breadcrumbs. Bake in at Gas mark 5/180 degrees for 40 minutes until golden. This tastes great with just about any roast and also makes a lovely supper with a simple green salad. There may still be a few tomatoes and scallions about, but there’s no denying that veg wise the season has changed. My oven is now on at least a couple of afternoons a week, roasting up parsnips and carrots, spuds, maybe a chicken and if I have any stewing fruit around, there’s usually a crumble in there too. At the moment I’m experimenting with quince and fig recipes but more on that when I’ve figured things out. This week sees the return of celeriac which, if you haven’t seen it before, probably has you scratching your head. It’s the gnarly round thing at the bottom of your bag. No, it’s not much of a looker but it’s a great multitasker (just how we all want to be described right?). Like all roots, you can roast it, mash it, throw it into soups and stews or just boil it up (but don’t expect dinner to look anything but wartime if you go down this road – add a sprinkling of herbs at least). As the name suggests, it’s a cousin of celery and the flavour is vaguely similar but there’s also a lovely nutiness so it goes really well with hazelnuts. Cream, bacon, anchovies, onions (especially when cooked down in butter) are also welcome additions. This recipe started life as a soup at least in my mind, but as I turned it over in by head (yes, folks I probably do think about dinner way too much but it does drown out the white noise of children fighting) I decided a stew was needed. 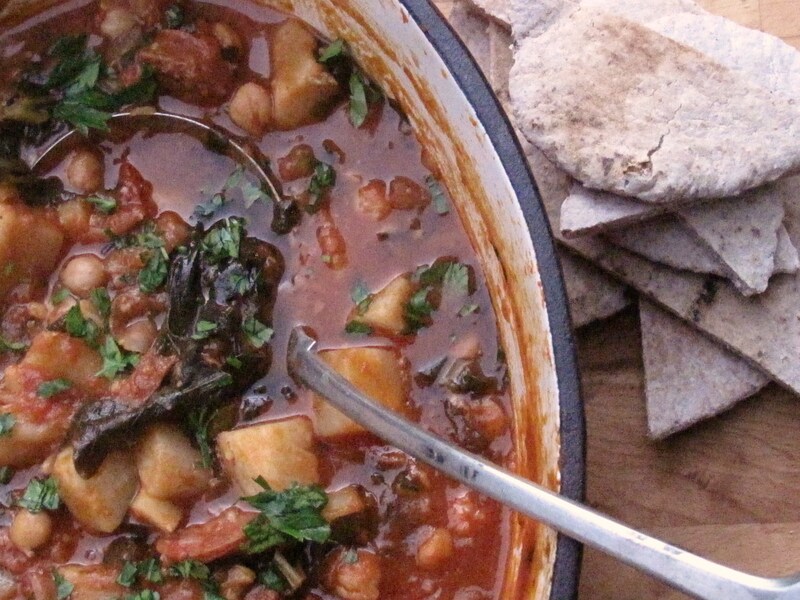 To kickstart things, chorizo was always going to be a key ingredient then chickpeas seemed a logical progression…. I love the mix of aniseed and celeriac together so I threw in some fennel seeds which brought things together nicely. Then for greens, kale in from the Healys this week was an obvious choice. It’s the Raggedly Jack variety which I haven’t bought before due to my allegiance to the Cavelo Nero kind. It’s pretty good – it doesn’t have the gorgeous forest green of its Tuscan cousin but tastes as good. If you don’t have kale, cabbage will work equally well in a recipe like this. As celeriac is starchy, I served this with bread the first time but we had it with spuds last night and they went down a treat. Rice or quinoa would work fine as well. Up to you…. Heat some olive oil in a heavy pot or casserole. Add the onions, bay leaves and a large pinch of salt then saute over a medium heat until they start to soften and change colour. Throw in the garlic and fennel seeds, mix everything together then continue cooking for another 2 or 3 minutes before adding the chorizo. Cook for a further 10 minutes or so, letting the chorizo release its oil and flavour everything. This is a good time to peel and chop your celeriac if you haven’t done so already. When you’re ready, add this to the pot and stir well. Add the tomatoes and sugar and allow everything to fry for a few minutes before pouring in the stock and chickpeas. Bring everything to the boil then turn the heat down, cover and simmer for about 30 minutes. Wash the kale well and remove any tough stalks. Roughly shred it and add it to the pot. Continue cooking for further 30 minutes removing the lid for the final 15. Before serving check the seasoning, adding more salt if you think it needs it plus a decent grinding of black pepper. To serve, add a scattering of chopped parsley if you have it. As you can imagine, this keeps very well and is possibly better on the second day. 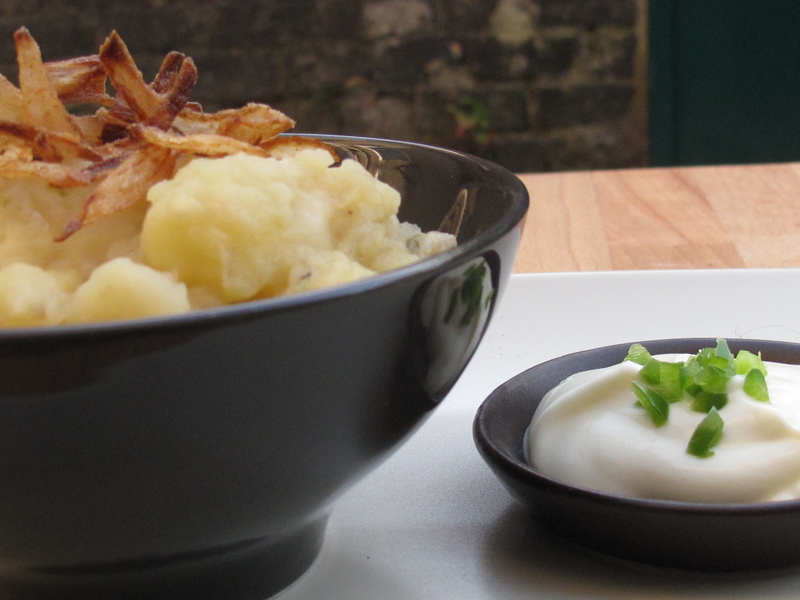 If you’re new to this seasonal eating lark celeriac might be a new one on you. Gnarly and none too photogenic, it’s often passed over at the veg shop and rarely finds its way into most supermarkets. This is a pity. Earthy and sweet (though not as much as say, parsnips) it has a lovely nutty flavour which the French put to good use in remoulade a simple grated salad with a mustard dressing. It’s really and I mean really good with meats like lamb and game when the comfort of a spud is called for and the flavour of the celeriac just elevates everything with its extra depth and interest. Like all roots it makes great soup, very tasty mash (but do be sure to add some spud as it can be watery on its own) and, if you can’t be bothered faffing around, can be parboiled then chucked in the oven to roast in olive oil with, say, rosemary or thyme. Nigel Slater suggests slicing then baking it in a slow oven with stock and a (presumably very generous) knob of butter. I haven’t done that but if Nigel rates it the chances are it’s great. Yesterday at lunchtime I revisited a recipe I hadn’t done for years. 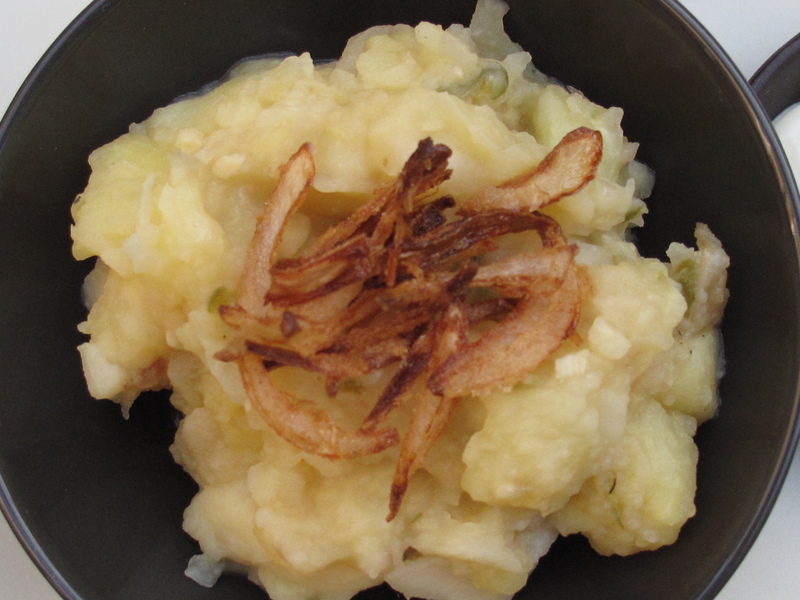 I cooked it in some vegetable stock with spuds, some golden-fried onions, garlic and fresh green chili. It’s a simple dish but all the flavours really come together and shine through making it very moreish. In this case the chili doesn’t add heat so much as flavour so don’t worry if you don’t usually eat hot things. The heat is barely a notch above black pepper. I tarted things up at the end by frying some crispy onions to top it off which added a great bit of extra texture. If you’re feeling lazy, don’t bother – it’s great without them. Lamb chops completed the meal, lightly seasoned and grilled til pink. I also served some plain yogurt alongside but Paul reckoned there was no need. Up to you…….. Begin by heating a generous glug of olive oil in a pot or pan. Add the onions and sauté until soft and beginning to change color. While the onion is cooking you can peel and chop your celeriac into large bite-sized pieces. Peel and chop the spuds too. When the onions are done, add the garlic and chili. Cook for a further 5-10 minutes until the garlic has softened then throw in the celeriac and spuds. Add the stock and a little salt and pepper, bring everything to the boil then turn down the heat and cook until the veg has softened (but not turned to complete mush) and the stock has more or less evaporated. The end result should be like a very roughly mashed mash (if you know what I mean!) as the spuds will fall apart but most of the celeriac will keep some shape. You can serve this as is with maybe a dollop of plain yogurt on top or on the side. To make the crispy onions, heat about 2 cm vegetable oil in a small pan. When it’s hot, dip the onions into a little flour. Shake off any excess (use a colander or sieve for this) then drop into the oil and fry until golden. To serve sprinkle on top of the celeriac and spud. Summer might be over but somehow we’ve managed to get hold of the absolute last of this year’s Wicklow tomatoes which makes a nice treat this week. As it’s winter I’d recommend slow roasting them with olive oil, chilli and oregano. Nice and slowly is the way to do it. Try to plan a few things for the oven so you’re not just turning it on for the tomatoes. The longer you can bear to leave them in the more flavor . After that it’s anything from straight up, roughly chopped and tossed with pasta, in a salad, with some beans, a roast…..
Quarter your tomatoes and put them in a small baking dish with a splash of olive oil and the other ingredients. Roast in an oven at about Gas 4/150 degrees for about 4 hours. If you’re cooking something that needs a higher or lower temperature that’s fine and obviously it’ll change the cooking time. Just don’t go too hot or they’ll burn before they really cook and sweeten. Wicklow proved a great source for us this week. Along with those tomatoes we made off with some fennel which is, I think, the first time we’ve sourced it that locally. They’re not fully grown (grower Marc Michel described them as “teen” which gave us a giggle during the week) so they’re tender and extra sweet. I reckon they’re crying out to be finely chopped and dressed with your nicest olive oil (speaking of which there’ll be a sample of some fab stuff we’ve managed to source from Italy in your bag next week which I think you’re going to like as much as we do – stay tuned!!) and lemon juice. Alternatively, try tossing it on the pan for a few minutes. Either way it’s fab and an obvious winner with fish. All our bags have Celeriac this week a variety some of you may not be too familiar with. It’s a celery flavoured root veg that can be used, like the other root veg, to make gratins and mash. If you you’re not a big fish person don’t be put off by the Anchovy, this dish doesn’t really taste of fish- the Anchovy accentuates the flavour of the rest of the ingredients. Begin by finely chopping the Garlic, Anchovy fillets and Chilli (remove some of the seeds if you think it’s a really fiery one). Roughly chop the Rosemary and combine it with the Garlic, Anchovy and Chilli and set aside. Finely slice the Celeriac. To put the dish together smear a gratin dish with a little Olive Oil and begin with a layer of Celeriac and then top with a scattering of the aromatic mixture and season well. Repeat the layers until all the ingredients have been used and then pour over a carton of cream (250ml) and place in a medium oven (190 degrees/ gas mark 5) and bake for 45-50 minutes until the Celeriac is tender and the gratin golden on top. The funny looking fruit in your Mediterranean bag is passion fruit. It looks like nothing from the outside but cut it in half and first of all you’ll get a blast of it’s amazing aroma then eat the flesh with a teaspoon and go straight to heaven…….. Enjoy! 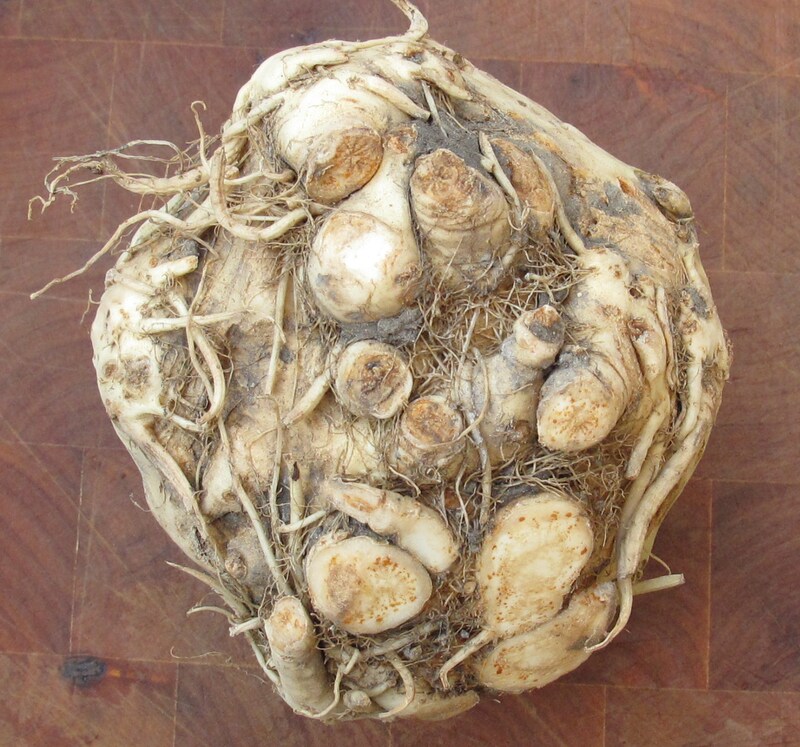 This week all our bags have Celeriac (that funny knobbly thing you might be wondering about) which, as its name and appearance suggest, belongs to the Celery family. 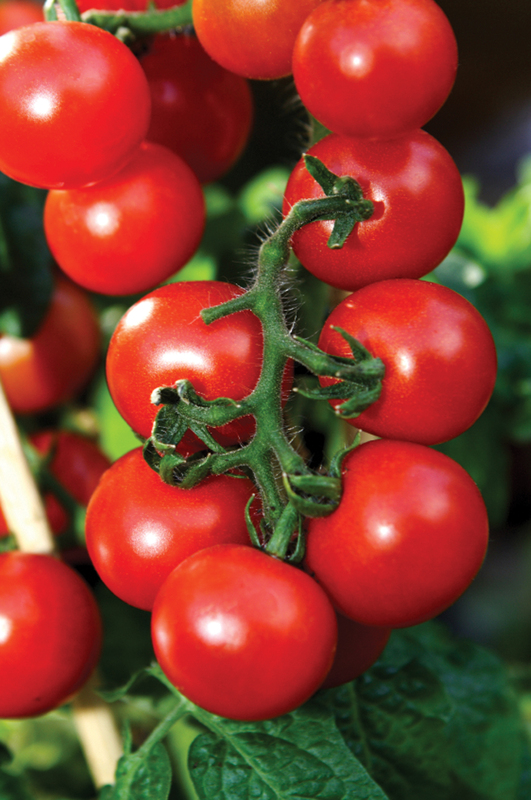 It has a mild nutty flavour and is much sweeter than Celery. It can be eaten both raw and cooked. Try roasting it in Olive Oil with Garlic and Thyme, adding it to soups, mash and purees or grated raw in salads with Vinaigrette or Mayonnaise. It will keep for a couple of weeks if you store it in a cool, dark place. When peeled and chopped it should be kept in acidulated water (ie. water with some Lemon juice) if you’re not using it immediatelty as it discolours. Peel the Celeriac and Spuds then cut them into chunks. Throw into a pot and cover with water. Bring to the boil, lower the heat then cook for a further 15 minutes. Drain well and mash adding a generous dash of Olive Oil and the juice of one Lemon. For a veggie meal put the mash into single serve dishesand top with rounds of Goat’s Cheese then grill until golden. Serve with a simple salad. Celeriac, as you might imagine, makes beautiful soup. This one is topped with crispy Pancetta (Italian Bacon) and Croutons which are a great contrast to the soup’s velvety texture. Perfect for these cold evenings……..
Add the stock and bring everything to the boil then lower the heat and to a simmer and leave to cook for another 15 – 20 minutes or until the Celeraic is tender. Turn off the heat and liquidize until very smooth, check and correct the seasoning if necessary and finally stir in the cream. To serve finely chop the Pancetta and fry in a drop of Olive Oil. When it’s starting to turn crispy throw in the Croutons and toss until golden. Sprinkle on top of each serving and serve. If you’d prefer something lighter, Celeraiac and Toasted Hazelnuts make a great autumn salad. Toasting the Haelnuts really brings up their lovely earthy flavour which is fab with the nuttiness of the Celeraic. If your Hazelnuts are unpeeled this process will help lift their skin off which you can then remove by rubbing the nuts between your palms. Toast them on a dry, unoiled frying pan over a medium heat for a couple of minutes, shaking the pan a couple of times to ensure they toast on all sides and don’t burn. When the skin starts to blister and they are changing colour take them off the heat and allow to cool before removing the skin as I suggest above. Don’t worry if it doesn’t all come off. Alternatively, you can buy them pretoasted in most health food shops. Coarsely chop your toasted Hazelnuts (you want chunks rather than little bits) then mix with the Celeriac. Dress the lot with 6 Tabelspoons Olive Oil, about 2 Tablespoons Lemon juice and a pinch of Salt.If you prepare this salad ahead of time, you may need to add a little more Lemon juice before serving it as the Lemon tends to lose its zing over time. Cooking Apples are now in season as are Quinces both of which make fantastic crumbles. I’ll have them next week so let us know if you’d like some.